Folks, now's a good time to take a moment to check in about what's happening in Hero Forge Games land. The Hero Kids Bundle of Holding closed several weeks ago, with 1,008 new Hero Kids families joining our community, and $1,700 donated to the Reading Is Fundamental charity. By now you should know that I recently released the Forge Engine - Universal Role-Playing System. In addition to that new hotness, I also just released the Hero Kids core 10 heroes in Danish. I was recently interviewed by the amazing Boomer Radio Network, so listen in to hear all about the development of Heroes Against Darkness, the ongoing world of Hero Kids, and my latest Forge Engine - Universal Role-Playing System. Moving on to something straightforward. I've been working on the card-only version of The Road to Ruin, which is available through DriveThruCards (this may not be available right now). 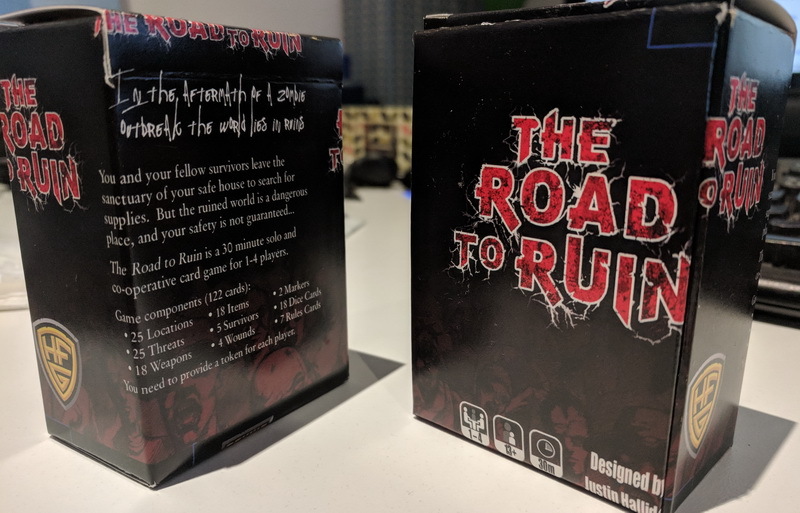 DriveThruCards recently released printed tuckboxes, so I've been working on a tuckbox for The Road to Ruin. Moving along, let's talk about the Forge Engine - Universal Role-Playing Game, which has been downloaded over 5,000 times from DriveThruRPG (a huge first response!). And there's a bunch of work to do on Forge Engine, so let's dive in. 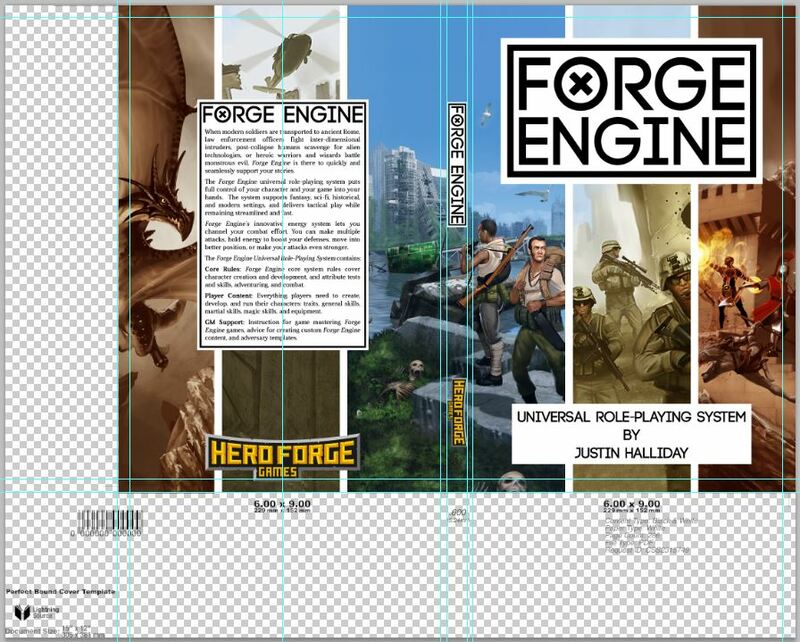 First, I'm working on the print version of Forge Engine. The first proofs are currently on they way to me (in Australia) right now. While the artwork in Forge Engine is grayscale, I'm experimenting with a colour book so that it has the parchment look of the PDF. Let's hope this works. Second, I need to work up a bunch of pre-gen characters for Forge Engine. This will go into the core download, and help people get an idea of what Forge Engine characters can look like. 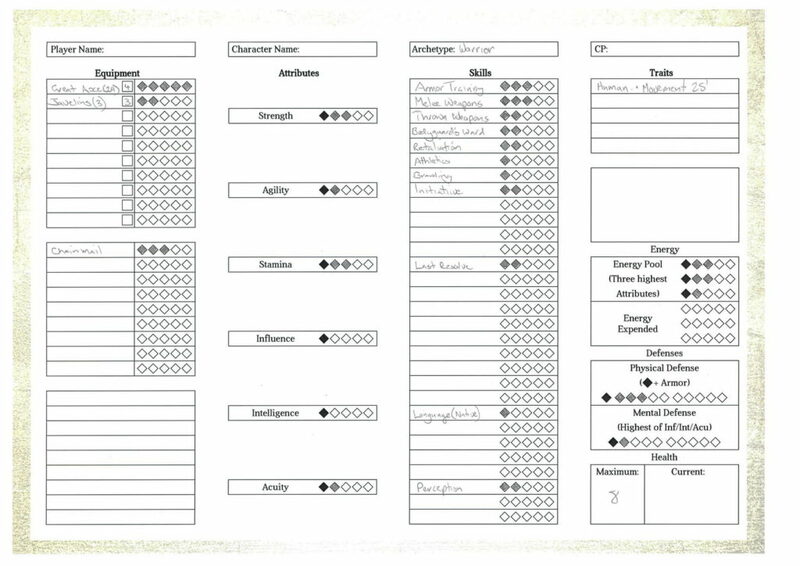 In addition to the pre-gen characters, I'm incrementally working on fillable Forge Engine character sheets, as well as a bespoke fantasy character sheet. Finally, while Forge Engine is a designed as a system and not necessarily a complete 'game', I feel like I should work up a set of introductory adventures that progressively guide players and game-masters through the core interactions of the system, and introduce them to simple and challenging combat encounters. Okay, let's talk Hero Kids. Hero Kids continues to be the bread-and-butter for Hero Forge Games. And while the number of releases for Hero Kids has (deliberately) slowed, I continue to support and develop for Hero Kids. Right now, I'm actively working on several Hero Kids projects. The first of these is a French translation of the Hero Kids core rules and the Basement 'O Rats adventure. This is an experiment for me to see what this involves (a lot of work), and whether there is demand for these. Hero Kids Adventure Compendium II: This print book would collect the hard adventures into a second book. Hero Kids Monster Compendium II: There's always demand for more monsters, and a second Monster Compendium would explore more monsters from across the varld of Hero Kids. Finally, I have artwork and ideas for a set of equipment for the Space Heroes sci-fi setting. My progress through this work schedule is based on my work capacity and various life obligations. So if there's something on this list that you're especially looking forward to, drop me a comment below and I'll ensure it's prioritized. I’ve played through 3 adventures (Basement Rats, Ghost Pirates, and Wizards Tower) with my 4 year old, and each time it was a highlight of our month. Any chance of seeing one or two more Easy adventures in the future? Hey Craig, I’m getting to work on a new adventure soon. It should be on the shorter side, like those that you mentioned.